It is very important to reveal the secrets of your dentist and here are given some of the most important facts which can be considered in this regard. This section will also help you to understand the way which is proved to be helpful in order to keep your teeth healthy for a lifetime. There are several questions which arise on your mind like who will win a battle between an electric as well as a manual toothbrush? What is so special about the fluoride? What does the dentist do in order to keep their teeth sparkling for life? 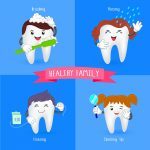 What Is Your Personal Routine For Getting Healthy Teeth? You need to specifically keep it simple. After eating breakfast, it is required to brush your teeth for about 30 minutes and also just before bed. In this way, the fluoride in your toothpaste has preferably a chance to work like a magic. Also, mouthwash should be used with fluoride when you need a quick freshen up after the meals. But, the floss is only required when you want to keep. Why Is It Considered To Be Very Important To See The Dentist Every Six Months? There is a huge importance of six to twelve monthly check ups to the dentist and it could contribute to saving your money in the long run. It is also much more than just your teeth as it has a relationship with the whole body. So, it is preferably required to check soft tissues as well as lymph nodes (for cancer), airways (for sleep apnoea) as well as jaw joints (for grinding). This helps to ensure that your overall health is preferably in good check. Electric Toothbrush Or Manual Toothbrush – Which One To Choose? It is considered to be an age-old debate and it is like that your technique as well as the way in which you use it matters the most but not the tool which you used for the job. The majority of the people are involved in finding that they get far superior clean teeth with some sorts of power in their brush. What Are The Most Surprising Things Which Can Be Considered About The Way To Keep Your Teeth Healthy And Strong? After brushing your teeth, it is specifically advised to not drink, eat or rinse for about 30 minutes. Also, a lot of people usually rinse with water after brushing which helps to wash off the protective fluoride. For your teeth, you also need to think of toothpaste as a kind of daily medication. Immunoglobulin A is generally contained in your saliva. This helps to protect your teeth as well as mouth from bacteria. To counteract this, you may particularly require more fluoride in your toothpaste if you develop a dry mouth. Many harmful acids in the mouth are generally neutralized by your super saliva. It usually takes 20 minutes of time to specifically fight the acid which is caused by sugary foods. This is the main reason why the frequency of drinking or eating sugary things matters the most rather than the quantity. It is advised to have a sugary drink with a meal and so, you should not sip it throughout the entire day. There are many harmful acids which are produced by the bacteria living on your teeth and so, the eating of dairy foods after a meal like cheese board will preferably help to protect your teeth from these acids. But, the vanilla ice cream does not count in this regard. Lastly, you need to be aware of the hidden sugars. What Is More Important Flossing Or Brushing? You would preferably have to go with brushing. The toothpaste generally is involved in making a lather which helps to lift plaque and also the fluoride present in the toothpaste is proved to be very helpful for your tooth. Hurry; book your appointment now in order to avail the best dental services in Melbourne. Afterhours appointments are also available.